Jaycee Paul Roth plays "WAR" with Prom party goers. The Gateway After Prom is an annual event in the Clinton Area held in early May. This event is designed as an alternative place for students from Clinton High School, Camanche High School, and Fulton High School to go after their proms are finished. The Clinton Jaycees helps in organizing this event along with many people from the community. At the event the Clinton Jaycees provide Blackjack & Chuck-A-Luck. The Iten Family Christmas Display at its original location in front of the Iten home. The Iten Display at its current location beside the First Baptist Church. Several years ago the Clinton Jaycees resurrected pieces of the historical Iten Family Christmas Display from the City of Clinton. The display was setup at Mercy Health System-North and River Front Park before finding its final location at the First Baptist Church on North 3rd Street. Permanent electrical was installed and pieces have been added and refurbished with funding from the Iten Family Foundation and hard work by the Clinton Jaycees. at the Clover Hills Eagle store. During the month of January the Jaycees celebrate National Jaycee week. This week is to honor all Jaycees across the nation for their dedication to their communities. The Clinton Jaycees feel it is important to continue that dedication by holding a food drive at several local grocery stores in the area. This is held on the Saturday that ends the celebration of National Jaycee Week. Jaycee Brad Wendell helps with the softball throw. The Clinton Jaycee Hit, Run, & Throw is a baseball skills competition for kids between the ages of 6 and 12. This competition is held in conjunction with the Clinton Parks and Recreation Department. Flyers are sent out approximately 3 weeks prior to the event to all junior baseball teams in the area. This project takes place on a Saturday in June. The winners of the competition are entered into Jaycee regional and state competitions. The Clinton Jaycees pay any entry fees that maybe incurred. Approximately 25 to 50 kids participate in this event. Jaycees Ed Bellich & Steve Sander time the dribble competition. The Clinton Jaycees Run, Dribble, & Shoot is a basketball skills competition for kids between the ages of 6 and 12. This competition is held in conjunction with the Clinton Parks and Recreation Department. Flyers are sent out approximately 3 weeks prior to the event to all the grade schools and junior basketball teams in the area. This project takes place on a Saturday in January. The winners of the competition are entered into Jaycee regional and state competitions. The Clinton Jaycees pay any entry fees that maybe incurred. Approximately 50 to 100 kids participate in this event. The Clinton Jaycee Run, Punt, Pass, & Placekick is a football skills competition for kids between the ages of 6 and 12. This competition is held in conjunction with the Clinton Parks and Recreation Department. Flyers are sent out approximately 3 weeks prior to the event to all the grade schools and junior football teams in the area. This project takes place on a Saturday in September. The winners of the competition are entered into Jaycee regional and state competitions. The Clinton Jaycees pay any entry fees that maybe incurred. Approximately 25 to 50 kids participate in this event. Jaycee Kory Paukner poured a fresh sandbox for a very "patient" youngster. The Clinton Jaycees sandbox fill is an annual project done to help our local children. Two to three weeks prior to the event ads are placed in the Clinton Herald asking families to request a fill up to their sandbox. 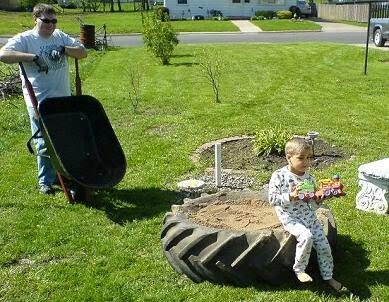 The Clinton Jaycees take orders for up to fifty sandbox fills and up to seven tractor tire deliveries. The donations of sand and tires from our sponsors (Quality Ready Mix Concrete Co. and Tandem Tire & Service), help make this project possible. Santa checks in on one of our local children. Christmas is such a busy time of the year for Santa Claus that he has called on the Clinton Jaycees to help him personally touch the youth of Clinton, Camanche, and Fulton by making a list of good boys & girls for him to call a few weeks before Christmas. 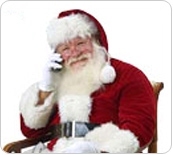 These personal calls bring much joy and happiness to the children as well as Santa. and Rob Ebensberger deliver Christmas gifts to the guests. The Senior Citizen Christmas Party is an annual event that takes place at the Eagle Point Park Lodge around the second week of December. Food, beverages, entertainment, and presents are provided. This event is open to all seniors in the Clinton Area. Transportation is available via Municipal Transit Buses which are rented for the evening. A special trip through the Symphony of Lights has also been included. Reservations are taken by the Retired Senior Volunteer Program (RSVP) starting 2-3 weeks before the event. 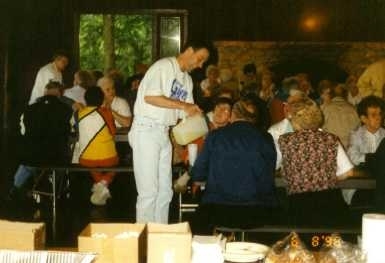 Pictured Above: Jeff Atkinson serves lemonade to some guests. The Senior Citizen Picnic is an annual event that takes place at Eagle Point Park Lodge in June or July. Food, beverages, and entertainment are provided. This event is open to all seniors in the Clinton Area. Transportation is available via Municipal Transit buses, which are rented for the day. Reservations are taken by the Retired Senior Volunteer Program (RSVP) starting 2-3 weeks before the event. 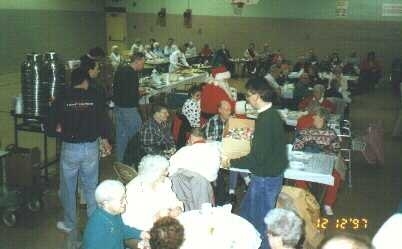 Several times throughout the year, the Jaycees bring and serve dinner to people at the Victory Center. This is just one more way that the Jaycees help out the less fortunate in our community.